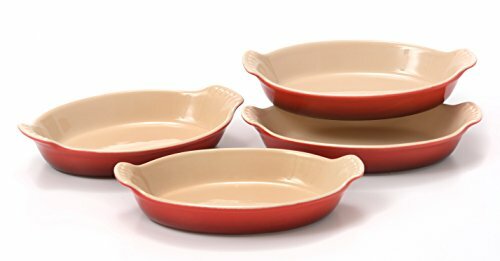 Treat yourself to something delicious with this set of four Le Creuset petite au gratin dishes. These incredibly versatile cast stoneware pieces are perfect for all of your needs, from baking to serving and even storing. Each cookware piece is fired at 2156 degrees Fahrenheit, making them virtually nonporous so they don't absorb flavors, odors, or moisture. The enameled surface also makes them incredibly resistant to scratches, chipping, and staining. The Heritage style flared handles allow for safe maneuvering directly from oven to table. Perfect for individual servings, these unique little dishes offer huge possibilities. Serve up some snacks, appetizers, or your very own creme brulee, and enjoy the easy clean-up when you're through. Suitable for use in the oven up to 500 degrees Fahrenheit, these dishes can be broiled or baked. Backed by a five year manufacturer's warranty, they are also dishwasher safe for easy cleanup.